The Migrants’ Files project was launched in August 2013 by a group of European journalists who joined forces to accurately calculate and report the deaths of emigrants seeking refuge in Europe. This pan-European consortium of journalists is partially funded by the European non-profit organization Journalismfund.eu. They know their lives are at risk, yet each year thousands of people from Africa, the Middle East and beyond — war refugees, asylum seekers and economic migrants — leave their homes and try to reach the promised land of Europe. On the third of October 2013, more than 360 would-be emigrants drowned off the coast of the Italian island of Lampedusa. A catastrophe of this dimension grabbed the media’s attention for a while and won the sympathy of the general public. In response, later that month, the European Council decided to implement measures aimed at preventing a repeat of such a tragedy at the European Union’s borders. The Council called for strengthening the EU’s border security co-ordination system, ­Frontex, more formally known as the European Agency for the Management of Operational ­Cooperation at the External Borders of the Member States of the European Union. And the Europe-wide surveillance system Eurosur began operations on December 2, 2013. Thus, once again, a large tragedy spurred real, if belated, action. Well-intended though they doubtless were, these measures only address the tip of the migration iceberg. Little is known about how many men, women and children actually have lost their lives on their journey to Europe. Believing that policy unsupported by facts cannot be optimal, a consortium of European journalists committed themselves to systematically assembling and analyzing the data on the deaths of Europe’s would-be migrants. By compiling rigorous datasets from various sources, The Migrants’ Files team aims at creating a comprehensive and reliable database on migrants’ deaths. Principal data sources for this effort include United for Intercultural Action, a non-profit whose ­network comprises over 550 organizations across Europe, and Fortress Europe, founded by the journalist and author Gabriele Del Grande, which also monitors the deaths and disappearances of migrants to Europe. The Migrants’ Files’ database also uses data from Puls, a project run by the University of Helsinki, Finland and commissioned by the Joint Research Center of the European Commission. A consistent methodology is applied to all data, starting with so-called “open-source intelligence” (OSINT). Originated by the intelligence services, this approach collects data from publicly available sources such as media reports, government publications and grey literature. In the case of The Migrants’ Files, the number migrants who die while seeking refuge in Europe is obtained by monitoring real-time global news on asylum seekers, migration and human trafficking activities in and around Europe. United for Intercultural Action monitored emigrant fatalities from 1993 until 2012, documenting about 17,000 deaths. Gabriele Del Grande reports more than 19,000 deaths since 1988. The database of The Migrants’ Files covers the period from January 1, 2000, until today. The journalists of The Migrants’ Files noted that the various data sources often lacked compatibility since each organization structures its intelligence differently. This required extensive data cleaning and fact-checking, using OpenRefine, an open source analysis tool. In a second stage, The Migrants’ Files journalists established a database on ­Detective.io, a web-based tool specifically designed to support information gathering efforts for large-scale investigative reporting projects. Early in the process of establishing The Migrants’ Files’ data methodology, sixteen students from the Laboratory of Data Journalism at the University of Bologna, Italy, contributed valuable fact-checking of more than 250 incidents, supervised by Prof. Carlo Gubitosa. The Migrants’ Files database of emigrant deaths now structures the data according to name, age, gender and nationality. Every fatal incident is recorded with its date, latitude, longitude, number of dead and/or missing as well as the cause. Overcoming the issue of data compatibility, The Migrants’ Files journalists have managed to create the most comprehensive survey of European migration fatalities available today. That said, the project team is aware that biases inherent in every dataset cannot be fully eliminated. What’s more, aggregating several sources of data can easily produce duplicates. When duplicates are detected are manually removed, one at a time. Accuracy is laborious. Beyond duplicates, some individuals had been registered as missing, say, identified by survivors of a shipwreck. If a body washes ashore in another location days or weeks later, it is virtually impossible to assign it to an earlier incident. And some fatal incidents have not been reported in any form. Hence, other sources of intelligence, such as testimonies, are carefully reviewed and double-checked before registering an incident in the database. Nonetheless, there is no getting around the fact that some individuals and events cannot be documented since no evidence offers confirmation. This sad reality cannot be redressed, rendering all fatality estimates conservative. The true numbers of dead are doubtless higher than recorded. Moreover, assessing the geolocation and mapping the registered incidents imposes other kinds of difficulties. The map of The Migrants’ Files also presents incidents far from European borders due to the methodology used. For example, a boat capsized on its route from Algeria to Spain can be geolocated in Algeria and at the country’s center. The Migrants’ Files is ongoing. The team continues to collect intelligence on the deaths of Europe’s would-be emigrants. The project aims to further improve the quality of its data, to shed more light on the situation of emigrants seeking refuge in Europe and to consistently track European asylum and migration policy, particularly because the broader media often ignores the issue until another large-scale emigrant tragedy thrusts it back to the top of the news cycle. A tide of humanity — people on the run from Africa, the Middle East and Asia — is washing over Europe’s boundaries, and many don’t survive the journey. The plight of migrants only grabs the media spotlight intermittently. It usually takes a disaster involving death in large numbers to drag this story into the public eye, although in fact it is a story that never ends. And the inevitable deaths are ongoing regardless of the attention or inattention they receive. For example, in early February 2014, at least 15 migrants drowned as hundreds tried to reach the Spanish enclave of Ceuta from Morocco. 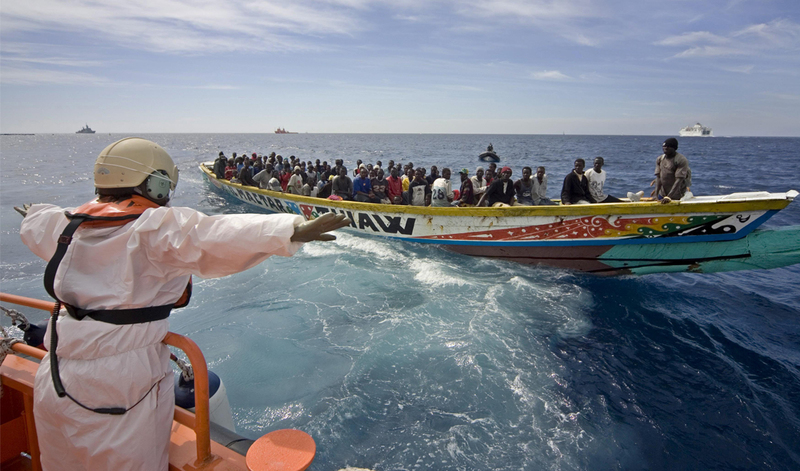 And one of the most ­wretched ­recent incidents, in October 2013, involved the death of over 360 people off the coast of the Italian island of Lampedusa. Tragedy on this scale demands, and generally gets, the attention of the broad public and political leaders. During his visit to Lampedusa after the October 2013 disaster, José Manuel Barroso, President of the European Commission, proclaimed, “The European Union cannot accept that thousands of people die at its borders.” Malta’s Prime Minister Joseph Muscat also issued a statement after the tragedy, warning that the Mediterranean risked turning into a “cemetery” for desperate migrants. These well-publicized incidents, and the bursts of engagement from politicians and officials that follow, highlight the conflict at the heart of Europe’s asylum and migration policies: on the one hand, the authorities acknowledge the humanitarian imperative of saving lives at Europe’s borders while at the same time they vigorously apply politically driven policies that restrict migration. In the end, the dynamics that put so many lives at risk remain unaltered. Catastrophes grab the headlines; smaller incidents often go unreported. Any reliable overview of migrants’ deaths has been difficult if not impossible to achieve, until now. Thanks to The Migrants’ Files, compiled by a consortium of more than 10 European journalists, the most comprehensive and rigorous database on migrant fatalities ever assembled is now up and running. Their assessment is shocking: since the beginning of the century more than 23,000 people have died or vanished attempting to enter Europe. Their approach was to use “open-source intelligence” (OSINT), a method originated by the intelligence services, acquiring data from publicly available resources such as news media, public data or grey literature. This material has now been collected, screened, cross-checked, analysed and registered in one database. The main data sources for The Migrants’ Files are United for Intercultural Action, a non-profit which coordinates a network of over 550 organisations across Europe, as well as Fortress Europe, founded by the journalist and author Gabriele Del Grande, which monitors the deaths and disappearances of migrants to Europe. The Migrants’ Files’ database also uses data from Puls, a project run by the University of Helsinki, Finland and commissioned by the Joint Research Center of the European Commission. The findings of The Migrants’ Files data mining have been eye-opening. The number of fatalities suffered by migrants on their journey to Europe turns out to be much higher than previously believed. Earlier estimates had ranged from 17,000 to 19,000 victims since the early 1990s. However, the estimated number including carefully assessed ­undocumented cases is indisputably higher. The Migrants’ Files data indicates that migration flows vary between sea and land routes according to season, flaring or ebbing depending on local conflicts and war zones, as well as the preferences of human traffickers. In recent years, the European Union has concluded a series of bilateral agreements with various north and west African countries and has undertaken several measures to tighten border security along Europe’s borders. As these measures came on stream, the routes taken by migrants shifted from Spain, to Italy and then Greece, underscoring the dynamic, adaptable nature of migrant flows. Frontex is the European Union’s border security coordination system. Its Operation Poseidon aims at tightening border controls between Greece and Turkey. In addition, on its own, Greece added some 1800 police officers to patrol its border with Turkey in response to the rising flood of migrants attempting to cross that border in the period from 2008 to 2012. The number of migrants observed travelling overland from Turkey into Greece ­subsequently fell from more than 55,500 in 2011 to just over 12,000 in 2013. Meanwhile, the sea route between these two eastern Mediterranean neighbours saw an increase in detected emigrants from less than 1,500 to over 11,000 in the same period, an eightfold increase. At the moment, a growing number of migrants are making their way to Europe via the Greek islands and, once again, Italy. Since the land route from the Horn of Africa through Sinai into Israel has been cut, the sea journey between Libya and Lampedusa has lately returned to favour among the traffickers, who claim to arrange passage for paying migrants. As a jumping-off point, Libya is currently one of the main hubs for migrants wishing to enter Europe. Libya’s lack of effective law enforcement, reflecting the country’s growing power vacuum, only makes the situation of migrants more precarious.